We’ve all faced it! After pushing many updates to GitHub, you realize that you haven’t pulled from the git server onto your web server. Soon, you cannot see your updates on the web server. So, how do you solve this problem? 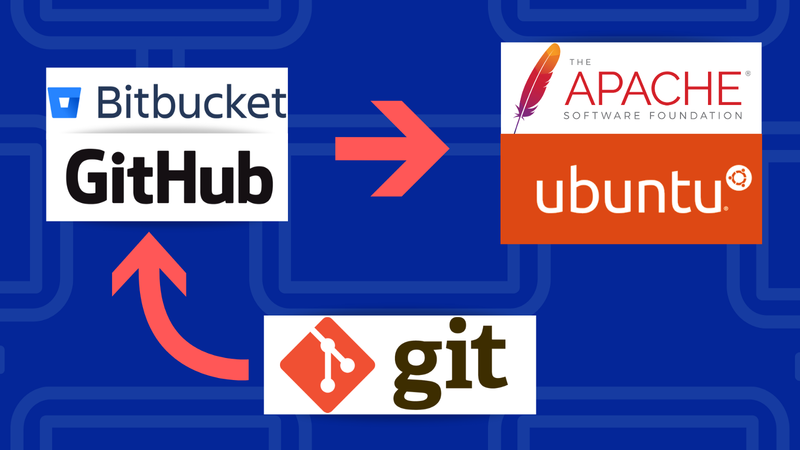 How do you make the git server sync with your web server? Webhooks are “user-defined HTTP callbacks”. They are usually triggered by some event, such as pushing code to a repository or a comment being posted to a blog. When that event occurs, the source site makes an HTTP request to the URL configured for the webhook. Users can configure them to cause events on one site to invoke behaviour on another. The action taken may be anything. If you didn’t understand a word of that definition, webhooks are HTTP callbacks that do some action when an event is triggered. In this case, we will be configuring the webhook to execute a pull command from the shell when a push event is made to the git server. PS- If you haven’t set up your git server on github.com, I would advise you to do so now! If you’re wondering what the word “git” means, learn git off the official website: git-scm.com. Now that we understand the functioning of webhooks, let’s create our first webhook! Note- Although I have added the bitbucket logo on the cover image, I haven’t tried it out on a BitBucket repository. There shouldn’t be much of a difference while configuring bitbucket webhooks. Nevertheless, hit me up in the comments section if you run into problems! What do these fields represent? Payload URL- This is the URL the webhook will ping when an event is completed on the GIT server. Content Type- We aren’t going to worry about this because we aren’t going to configure the webhook with a secret as the verification process is time-consuming. Secret- Again, I’m not going to configure the webhook with a secret as the verification process is time-consuming. However, I have a way to work around this problem. SSL Verification (Secure Socket Layer)- If your payload URL has an SSL certificate (https://domain.tld), then you will have an option to enable SSL verification which will encrypt all the connections. Else, if your payload URL does not have an SSL certificate (http://domain.tld), then you will not see the option. 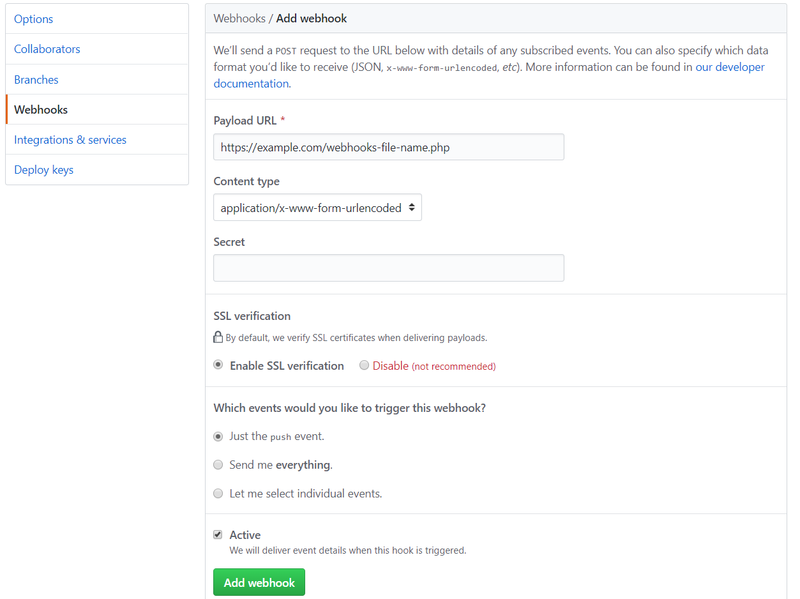 Events- Define when the webhook should be triggered. Active- Leave the box checked (Recommended). If you want to disable the webhook (NOT RECOMMENDED), then uncheck the box. More information on the official website here. We have configured the webhook! Note- I have only faced this error on Ubuntu as the OS has predefined users on setup; furthermore, the root user isn’t the user performing operations for an Apache/Nginx Server on Ubuntu. To do this, create a .php file in your public directory and add the following code. Visit the page using a browser and see the output. The output displays the web server’s user that is performing the operations on the web server. If you’re using Ubuntu 18.04 LTS, the user will most probably be “www-data”. I will use “www-data” as the user throughout this tutorial. Note- Skip the following steps till the next breakpoint if you are not using a Private Repository. While pulling from the GitHub repository, you cannot use the HTTPS method if you are using a private repository. Moreover, you will have to use the SSH method as it only requires the SSH key for authentication while pulling from the repository. “-Hu www-data” part is running the command as the “www-data” user in this case. Save the SSH key in the default folder and DO NOT SET A PASSPHRASE. Note- If you get an error which says that the folder does not exist, then you might have to manually create the folder by running the following command. 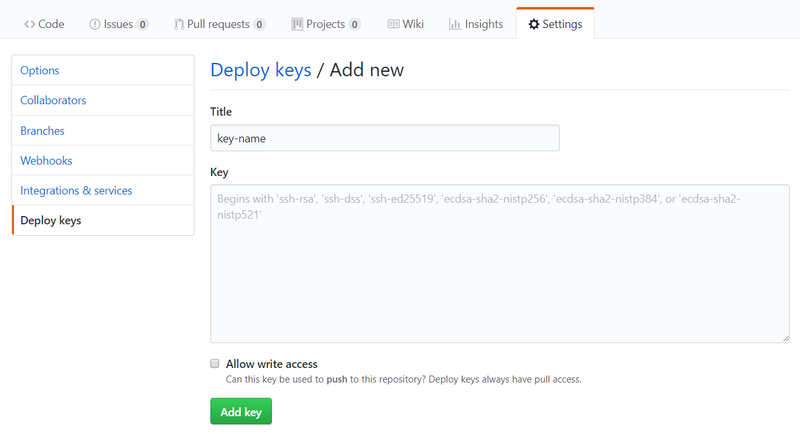 In the GitHub repository, go to Settings->Deploy Keys->Add Deploy Key. Allow write access- Since we’re just going to be pulling from the repository, we do not need write access. However, if you want to push to the repository, then you need to “Allow write access”. More information about adding deploy keys here. Congratulations! You have successfully configured a webhook with GitHub! Now push code to your GitHub repository and watch the magic happen! Now the webhook has been configured with some form of security! Stay up to date with my medium posts by following Pranav Shikarpur on medium. Innovator | Entrepreneur | Musician | Founder at Pranav Ventures | This description is too short :P. Visit- snpranav.com for more info!